Maybe we are all now a little inured to the claim that Beijing is faking its numbers. If so, its a little ironic that the little informed commentary I saw was, I think its fair to say, skeptical about their results. But I found the paper credible. Partly because I’ve long been sympathetic to the central claim (so maybe I’m biased), but partly because their work struck me as serious. The argument was a little more subtle than some of the commentary I saw. Chen et al. argue that while the national NBS distrusts localities’ data - since everyone knows they exaggerate their numbers (particularly fixed asset investment) - the central NBS folk are still partly reliant upon it. NBS HQ, for instance, has an industrial firm census, data for which firms themselves are responsible for inputting online, but that’s only a small part of what they need (and those firms anyway are thought to plug in impressive numbers). There’s a big economic census, which is really groovy, but its only a five-yearly snap-shot and takes ages to come out. So, the NBS has to use its surveys to adjust the local data, which are the still thus the foundation of the quarterly and annual national accounts. And the authors present evidence that NBS has failed to sufficiently adjust down the local data since 2008, particularly their investment numbers. They use two methods to do so. The first shows that value-added tax (which is very hard to avoid since trading partners demand VAT receipts so that they can deduct it from their own tax bill) has consistently lagged official industrial value-added (IVA). This is important as IVA is the main basis for secondary (industrial) GDP. We have long known the IVA series has problems. Second, Chen et al. double-check this with another, more conventional model they build, which throws in the usual variables (urban night-light measured by satellite, electricity, railway freight etc.) to model GDP growth. Similar conclusion. Chen et al. have a number of super charts. 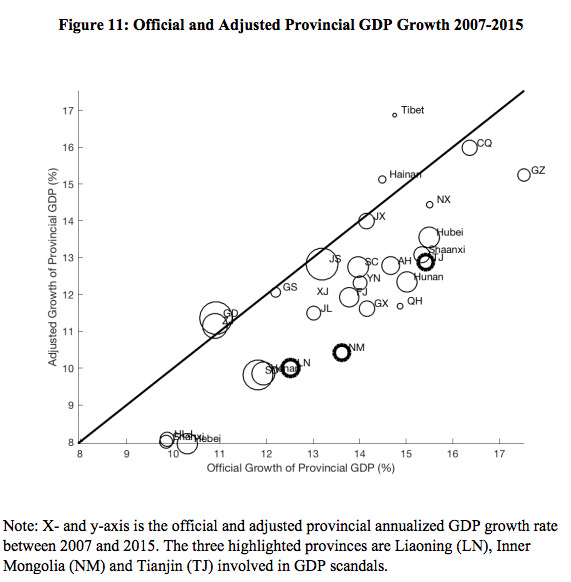 Figure 11 shows official nominal provincial GDP growth vs. their own estimates over 2007-15. The further you’re away from the line, the more you’re lying. The coastal provinces are relatively trustworthy, and growing faster. For everyone else (and Tianjin! ), subtract 2-3ppts off their nominal growth rates. Chongqing is a an outlier, though - its data looks honest. Well done Mr. Bo, sir! Broadly, it substantiates the claims of the reformers that potential growth has slowed significantly since 2008. And that sets us up for even slower growth over the next decade, absent structural reforms. While Beijing is now aiming for 6% “more or less”, they should be getting used to 4ish%. This makes all the problems they face harder to deal with. Given GDP has been increasingly over-estimated, debt-to-GDP ratios may be higher than reported, and given Figure 11, they would be much worse in the northeast, northwest, central provinces, and Tianjin. I heard a Chinese economist proudly claim last week that China already had its own Detroits but its been able to manage them. (Unlike those dumb Americans. Another very well-known local economist in the same meeting bewailed the Americans for not respecting China, blah, blah.) Well, let’s see about those Chinese Detroits. Increasingly, the rich coast will be bailing out the rest of the country. (Which is curiously like America - I wonder if the bailed out will feel similarly resentful of the cosmopolitan compatriots? Takes me back to this post). The current account surplus would be a tad larger as a share of GDP (given GDP is smaller, and the BoP statistics are likely to be (broadly) accurate) - useful to remember when we debate the likelihood of it dipping into deficit this year. Given the key claim of the paper is that investment is over-estimated, investment as a share of GDP has likely declined a lot quicker than officially stated. Good news for all those who worry about the lack of a “transition to consumer-driven growth”. It’s happening, Yay! (I’m not one of them, by the way; I think the debate misses what’s important about medium-term growth, which is productivity). Chen et al. estimate an investment ratio of 36% of GDP, rather than 42% in 2016. And thus consumption picks up the 6ppts of slack. I fully agree with this. Finally, a related, and really important finding, is that the national savings rate has fallen by a lot more than NBS admits. As Fig 10:B shows, below, some 40% of national income is saved now, down from 50% a decade ago. Eye-balling the chart, it looks like that decline is coming from the corporate sector rather than households (but this is not definitive). Now, we also know that household savings rates (saving/household income) have been declining. This is important. But total household savings in GDP is largely defined by the share of income the top 20% income groups are getting, and their savings rates. I’d bet their share of the income pie is not declining all that much - and the rich have naturally high savings rates. This is a topic I’ll come back to. As I pointed out in my essay on China’s Disruptive Industrial Policy, that savings rate is really key for the sustainability of the current model. And so to the criticisms of the paper - which I saw primarily on Twitter, which obviously has its limits as a medium for debate, so I hope I represent them accurately below. First, one which is fairly easy to meet, I think, is that the authors misunderstood how the NBS constructs GDP because they claim its based on local government data. No, despite a couple of badly phrased sentences, this is not what Chen et al. are claiming; instead, they argue that the central NBS does not have enough of its own data to construct GDP themselves, so they have to use what they have to adjust down the local data. And that for the past decade they have not adjusted down enough. The authors do not postulate why this has happened - but the obvious reason must be political pressure to meet the annual target. And the NBS has not exactly been blessed with genius statistical leadership in recent years. The supposedly talented Qiu Xiaohua lasted seven months in 2006 before being arrested for having a second wife. Xie Fuzhan (2006-08) was next, but he had political ambitions - and soon went to run Henan. He was followed by Ma Jiantang (2008-16), who was supposed to be an economist but had little to show for his time at NBS. My favorite is his successor, Wang Baoan, placed at NBS after some dodgy dealings at the Ministry of Finance; he got arrested at the Beijing airport with his girlfriend trying to flee the country after just nine months (here). Ning Jizhe is now in charge; his background is in planning, within the NDRC and State Council’s research office. And planners always meet their targets. The best criticism of the paper I saw on Twitter was from The Economist’s thoughtful Simon Cox, who suggested that VAT revenues may not grow 1:1 with industrial value-added, even in the most stable economy. And more so in an economy, which since 2012 has been moving more sectors from revenue-based Business Tax to VAT. I hope the paper’s authors will take a look at that. Now, its not all bad. There are bits of the economy we probably are under-estimating, especially household consumption/services etc., for which much less data is available, so its hard to stress-test the NBS work. But back in 2014, the stupendous Rhodium Group published a great in-depth paper (Broken Abacus? ), which showed that GDP was likely under-estimated by 13-16ppts in 2008 thanks to under-counting consumption (see their table below). Much of this was due to NBS not properly counting housing. (Long story short, if you live in your own apartment, as some 80% of urbanites do, you do not pay rent, but you do derive a service, so the norm for national accounting is that an ‘inputted’ rent has to be estimated, which is then added to both sides of the household income statement. NBS uses the mortgage loan interest rate as a proxy for that, meaning a big under-estimate) Now, we were expecting NBS to upgrade their method in 2014/15, and significantly re-estimate GDP higher as a result, but they did not. 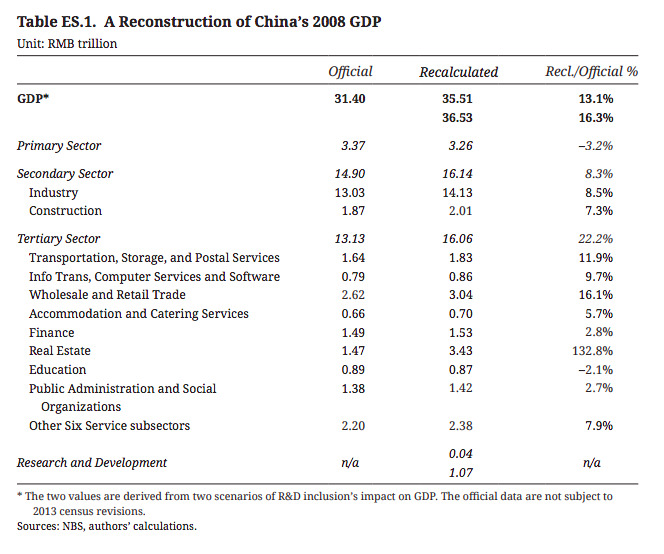 The revisions were a damp squib, basically just involving a better way of capturing R&D spend here. I guessed back then they’d “back-pocketed the hidden GDP, for strategic deployment later. Now, does this undermine the Chen paper? Well, partly, but not wholly. We are still likely missing that 13-16ppts, which is all on the consumer side of the economy, so that makes up a chunk of the gap that Chen et al. think we’re missing (some 12-15+ppts, assuming 1-1.5ppts a year for 10 years). This finding would also push consumption up even more as a share of GDP. But it might not do much for the growth rate, unless housing has been growing considerably faster than other parts of the economy. So bottom line, if Chen et al. and Rhodium are correct, the economy is likely about the same size as officially stated - but consumption is way bigger than stated, and recent growth has likely been slower (since the economy was already bigger 10 years ago). 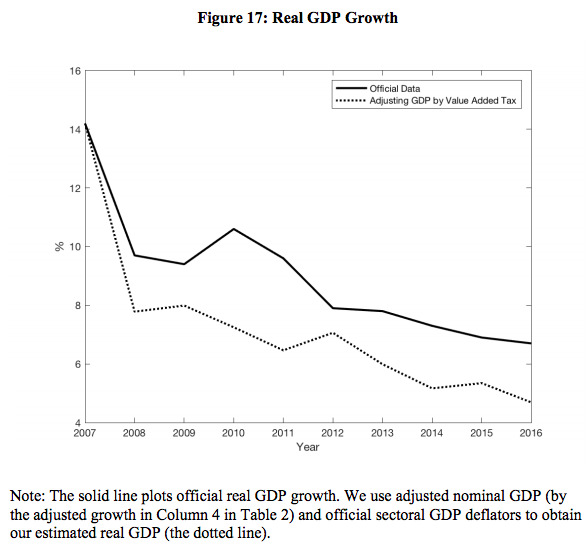 Finally, the biggest niggle I have with Chen et al.s re-estimated GDP series (see Fig 17 above) is the lack of any growth bump in 2009-10, when domestic stimulus was OUT OF CONTROL!!!! and global trade had picked up too, so exports were booming too. The economy was tripping back then. And then, again, in 2012-13, they have only only the mildest of re-accelerations, when things on the ground felt way better than 2011 after another quiet, mini-stimulus. Its possible that this may be linked with Mr. Cox’s point about the elasticity between tax and activity. But my suspicion is that they’ve bei huyou le (fooled) by the official deflators. 2009 was one of the few times the NBS had a big incentive to big-up, rather than downplay, the GDP deflator, in order to report growth that wasn’t OUT OF CONTROL!!! That’s probably flattened the 2009 recovery in this paper too - and (perhaps) in 2012 too. Anyone out there brave enough to re-estimate a deflator series?